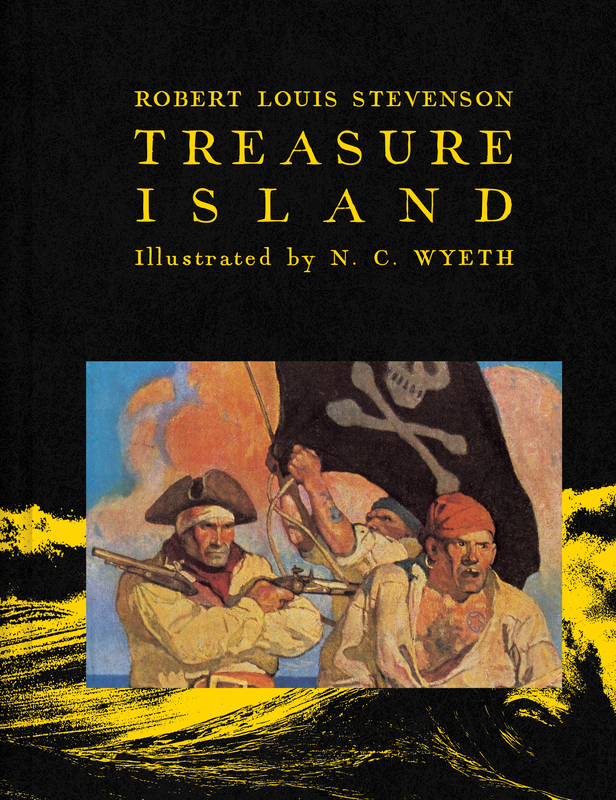 Robert Louis Stevenson’s classic pirate adventure that has thrilled readers for over a hundred years. Masterfully crafted, Treasure Island is a stunning yarn of piracy on the fiery tropic seas—an unforgettable tale of treachery that embroils a host of legendary swashbucklers, from honest young Jim Hawkins, to sinister, two-timing Israel Hands, to evil incarnate, blind Pew. But above all, Treasure Island is a complex study of good and evil, as embodied by that hero-villain Long John Silver, the merrily unscrupulous buccaneer-rogue whose greedy quest for gold cannot help but win the heart of every soul who ever longed for romance, treasure, and adventure. Squire Trelawney, Dr. Livesey, and the rest of these gentlemen having asked me to write down the whole particulars about Treasure Island, from the beginning to the end, keeping nothing back but the bearings of the island, and that only because there is still treasure not yet lifted, I take up my pen in the year of grace 17—, and go back to the time when my father kept the “Admiral Benbow” inn, and the brown old seaman, with the sabre cut, first took up his lodging under our roof. “Well then,” said he, “this is the berth for me. Here you, matey,” he cried to the man who trundled the barrow; “bring up alongside and help up my chest. I’ll stay here a bit,” he continued. “I’m a plain man; rum and bacon and eggs is what I want, and that head up there for to watch ships off. What you mought call me? You mought call me captain. Oh, I see what you’re at—there”; and he threw down three or four gold pieces on the threshold. “You can tell me when I’ve worked through that,” says he, looking as fierce as a commander. And, indeed, bad as his clothes were, and coarsely as he spoke, he had none of the appearance of a man who sailed before the mast; but seemed like a mate or skipper, accustomed to be obeyed or to strike. The man who came with the barrow told us the mail had set him down the morning before at the “Royal George”; that he had inquired what inns there were along the coast, and hearing ours well spoken of, I suppose, and described as lonely, had chosen it from the others for his place of residence. And that was all we could learn of our guest. But though I was so terrified by the idea of the seafaring man with one leg, I was far less afraid of the captain himself than anybody else who knew him. There were nights when he took a deal more rum and water than his head would carry; and then he would sometimes sit and sing his wicked, old wild sea-songs, minding nobody; but sometimes he would call for glasses around, and force all the trembling company to listen to his stories or bear a chorus to his singing. Often I have heard the house shaking with “Yo-ho-ho, and a bottle of rum”; all the neighbors joining in for dear life, with the fear of death upon them, and each singing louder than the other, to avoid remark. For in these fits he was the most overriding companion ever known; he would slap his hand on the table for silence all around; he would fly up in a passion of anger at a question, or sometimes because none was put, and so he judged the company was not following his story. Nor would he allow anyone to leave the inn till he had drunk himself sleepy and reeled off to bed. His stories were what frightened people worst of all. Dreadful stories they were; about hanging, and walking the plank, and storms at sea, and the Dry Tortugas, and wild deeds and places on the Spanish Main. By his own account he must have lived his life among some of the wickedest men that God ever allowed upon the sea; and the language in which he told these stories shocked our plain country people almost as much as the crimes that he described. My father was always saying the inn would be ruined, for people would soon cease coming there to be tyrannized over and put down, and sent shivering to their beds; but I really believe his presence did us good. People were frightened at the time, but on looking back they rather liked it; it was a fine excitement in a quiet country life; and there was even a party of the younger men who pretended to admire him, calling him a “true sea-dog,” and a “real old salt,” and suchlike names, and saying there was the sort of man that made England terrible at sea. In one way, indeed, he bade fair to ruin us; for he kept on staying week after week, and at last month after month, so that all the money had been long exhausted, and still my father never plucked up the heart to insist on having more. If ever he mentioned it, the captain blew through his nose so loudly, that you might say he roared, and stared my poor father out of the room. I have seen him wringing his hands after such a rebuff, and I am sure the annoyance and the terror he lived in must have greatly hastened his early and unhappy death. The old fellow’s fury was awful. He sprang to his feet, drew and opened a sailor’s clasp-knife, and, balancing it open on the palm of his hand, threatened to pin the doctor to the wall. Soon after Dr. Livesey’s horse came to the door, and he rode away; but the captain held his peace that evening, and for many evenings to come.